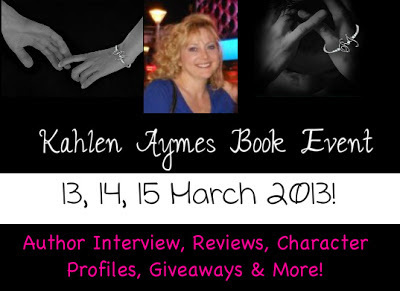 Kahlen Aymes 3 Day Book Event Introduction and Giveaway! Hey! I have been wanting to do this for quite some time! So.... The 13, 14 & 15 March are all dedicated to the amazing author Kahlen Aymes! There will be Character Profiles, Author Interview, Giveaways, Reviews & More! Isn't it gonna be AWESOME?? Kahlen Aymes grew up in the Mid-Western United States and was educated at a private university. She is divorced with one daughter, has a B.S.B.A. degree in business/marketing and began writing as a way to network a business venture. Soon, writing turned into her passion and morphed all other career goals. Her readers have told her they want to read angsty, passionate love stories that put them into the pages. She does her best to deliver! Her work was described by her publisher as "...a female fantasy - the intersection of perfect love, tragedy and raging intimacy." Nominated for numerous writing awards in the second largest derivative fiction community in the world, she has won several, including Best Author, Best Angst, Best Love Scene, Best Indie Fiction & Best Series. Kahlen enjoys communicating with her readers far and near, and encourages them to contact her personally! Ryan Matthews has everything he ever wanted. Close to graduation from Harvard Medical School and on the verge of marrying his gorgeous and accomplished girlfriend, Julia Abbott, his dreams are about to come true. Julia is on the fast track as a fashion editor for a big New York magazine. Ryan plans to join her there to complete his residency at a major trauma center and all of their sacrifice is finally at it's end. When tragedy strikes, their relationship is hurled into turmoil that leaves Ryan devastated as sorrow drives him to keep his distance, while Julia reaches out to find him again. What do you think of The Remembrance Trilogy? Have you read the books? Can't wait to see what goes on in the next three days... Will you get Kahlen to spill any secrets??? Thank you for introducing me to the Remembrance Trilogy. I really enjoyed these books. Unfortunately I do not own them...The first time I read them they were simply fanfiction. I am so glad that the author managed to published them because they are really worth reading. At this stage all I know is that I would love to read them.